Hello PinkWhen readers! 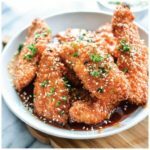 Justine from Cooking and Beer here to share my favorite monthly recipe with you all. These sweet and sticky chicken strips are so amazing you guys. 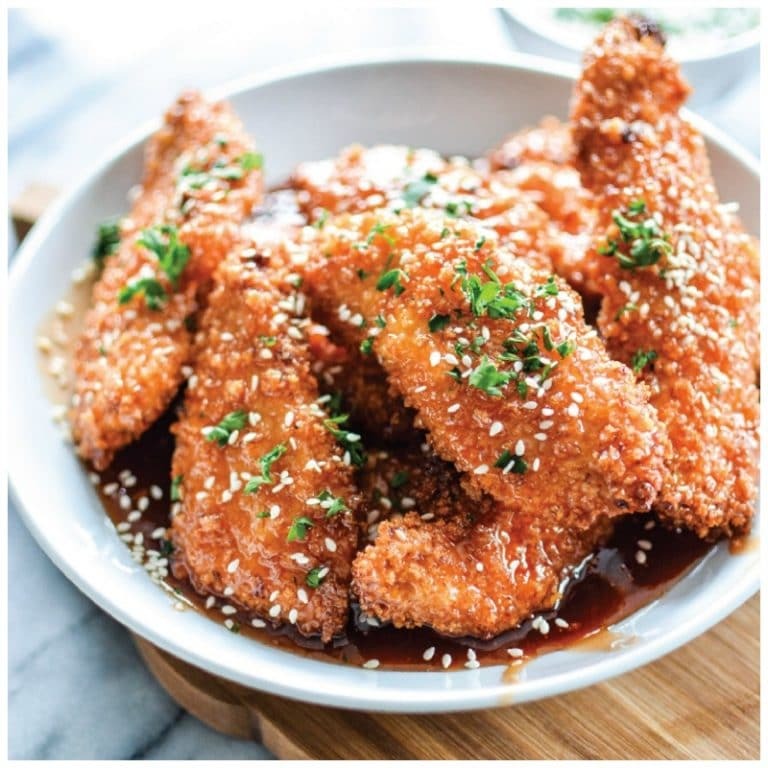 Chicken breast is sliced up into thin strips, dredged in a crispy, crunchy panko bread crumb mixture and then baked to golden perfection. That’s right. These amazing little bites are baked, not fried. 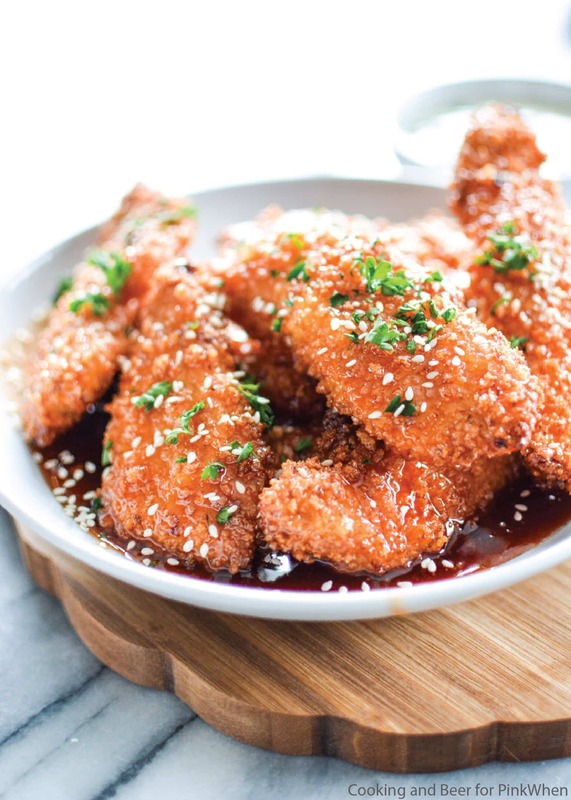 Tossed in a sweet and sticky sauce, these chicken strips are a must-have weeknight meal! How is everyone’s spring going? My better half and I have had a very busy spring so far. With an immense amount of traveling, getting ready to list our house for sale and building a new home, we have been super busy. Oh, and there’s also my nightly Netflix binge-watching fest, but whose keeping track of that really? With all that is going on in our lives, easy dinners are best and so totally necessary. I’m sure you can relate. I can’t tell you how many times after a long day of cooking, writing and blogging, I don’t even want to think about cooking dinner. Poor Zach (that’s my better half), sometimes he’s stuck with an omelet and a small salad. This happens at least 2 to 3 times a week. Enter chicken. Chicken is a staple in my house. I will normally grill or bake a couple of pounds of chicken at the beginning of the week, and add it to salads, eggs, and other simple recipes as the week progresses. These sweet and sticky chicken strips have made quite a few appearances on my dinner table lately because they are so easy AND quick to make. ….seriously, I do. Recipe is below! Preheat your oven to 450 degrees F and line a large baking sheet with foil. Spray it generously with non-stick spray. Set aside. To one shallow bowl, add the flour. To a second shallow bowl, add the egg wash (2 eggs mixed with 1 tablespoon of water); and to a third shallow bowl, combine the bread crumbs, salt, garlic powder and cayenne pepper. Dredge the chicken strips in the flour, shaking to get rid of any excess. Transfer to the egg wash and fully coat. Finally, place the chicken strips in the panko bread crumb mixture and press to adhere where necessary. Place the chicken strips on the prepared baking sheet and spray generously with a non-stick spray. Bake for 20-22 minutes or until crispy, brown and cooked through. While the chicken is cooking, prepare your sauce. In a medium saucepan, whisk together the brown sugar, cayenne pepper sauce and butter. Bring to a boil, stirring constantly, and then remove from heat. Once the chicken has cooked, toss it in the sauce. Serve immediately with ranch. Enjoy! Chicken breast is sliced up into thin strips, dredged in a crispy, crunchy panko bread crumb mixture and then baked to golden perfection. That's right. These amazing little bites are baked, not fried. 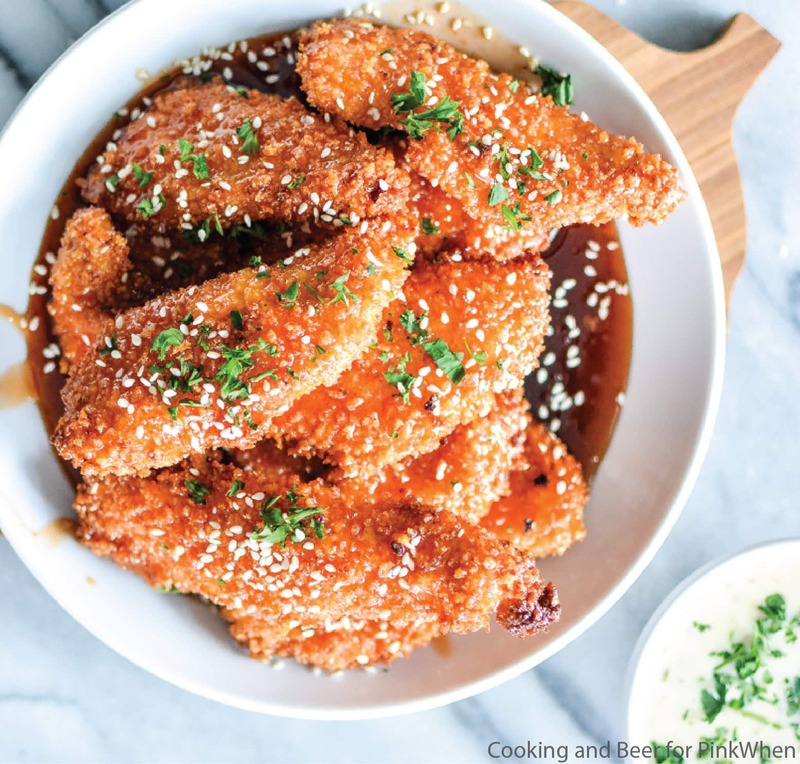 Tossed in a sweet and sticky sauce, these chicken strips are a must-have weeknight meal! I hope you guys will love these sweet and sticky chicken strips as much as I do! They are so addicting! Have a wonderful Thursday, friends! I’ll see you all next month! These sound great!!! Found you at Share it One More Time! Ohhhhh man… anything that looks that crunchy… I MUST try 😀 These chicken strips look great! Thanks for the delicious recipe. Just wondering, I can’t copy and save to “Pepperplate” and can’t find the print icon. Am I missing something, really want to try it..Thank you! This looks incredibility delicious! Thanks for linking up with What’s Cookin’ Wednesday! 1. I’m sure there are a lot of spicy heat lovers out there, but for the rest of us, what’s the dish like without the hot sauce? 1/2 cup cayenne pepper sauce… YIKES! I can’t take that much of that kind of ingredient, and I even have to be careful where it comes to adding the tiniest amounts of cayenne itself because it acts like a nuclear bomb on my tongue. Would plain tomato or marinara sauce work an alternative for the hot sauce part of the sticky sauce? I’m talking subbing for texture, not for heat. Because I’m thinking that the body of the sticky sauce needs something besides brown sugar and butter. 2. 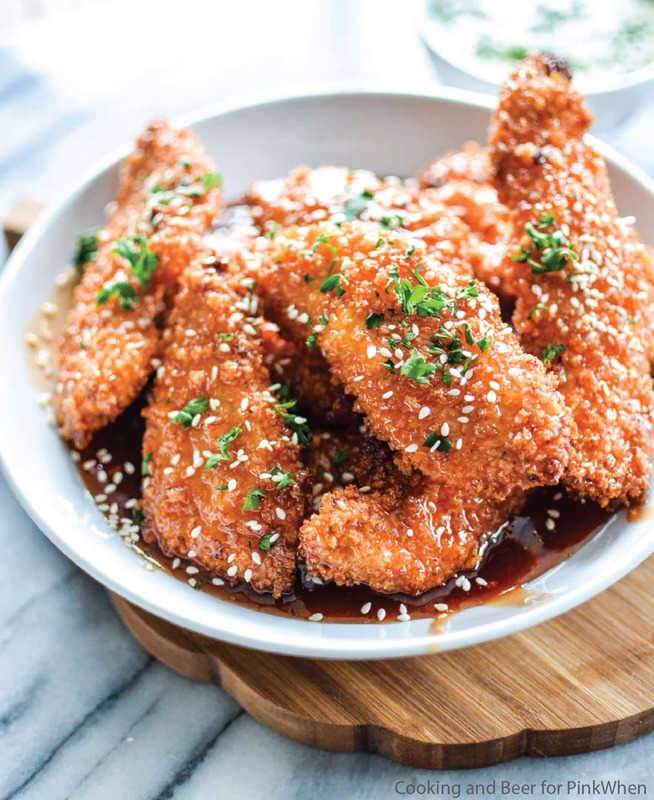 In the photo there appears to be an all-over sprinkling of sesame seeds on the sticky chicken strips, but I didn’t see sesame seeds in the list of ingredients. Would you say a teaspoon or two would do?